This manuscript lists herbs and other plants, animals, and birds, and their medicinal uses. Each is illustrated, but the representations were apparently copied from other manuscripts, rather than from life (it would usually be very difficult to identify the subjects of the miniatures without the aid of the text). This manuscript is related to several others, which seem to have been made in the north of England, perhaps Durham. 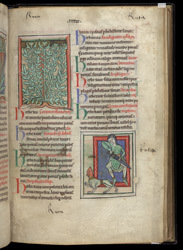 The top miniature depicts Rue (Ruta), which could be used for a variety of ailments, including sore eyes, forgetfulness, and lethargy; the lower one depicts a man drawing a sword to defend himself from a red-faced rabid dog, whose bite can be treated with the plant.